From earnings to cancer drug-test results, there were a number of movers Monday. Let’s see what’s grabbing the headlines out there and how we can set ourselves up for opportunity when trading on Tuesday. Bank of America Corp (NYSE:BAC) beat on top and bottom line earnings estimates on Monday before the open. Like JPMorgan Chase & Co. (NYSE:JPM), Citigroup Inc (NYSE:C) and Wells Fargo & Co (NYSE:WFC) though, BAC stock initially sold off of earnings, but is up about 1% on Monday. For whatever reason, BAC has found support near $29. So long as the stock stays above that level, bulls should stay long and look for BofA to get back above its 50-day and 100-day moving averages. 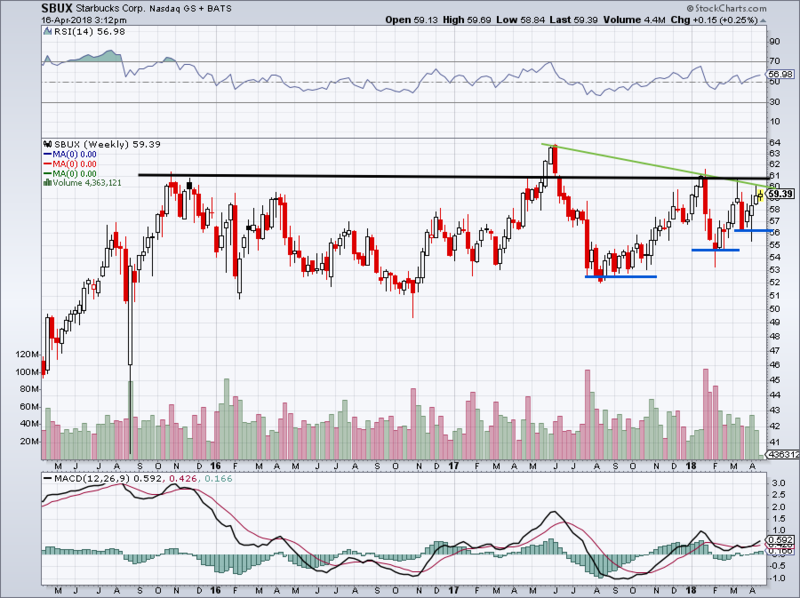 If it can do that, a retest of its $32.50 breakout level is in play. As of now, I see no reason to be a seller of the stock. 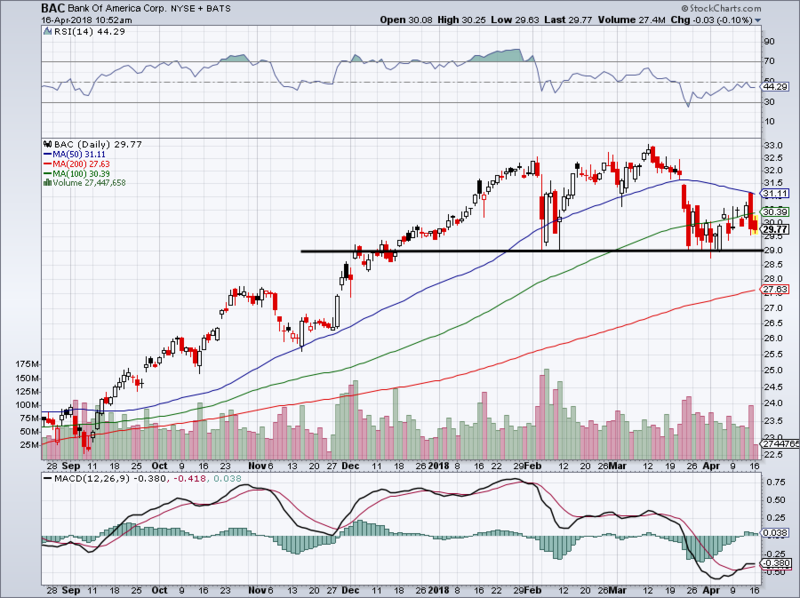 Support has held through two volatile market selloffs and through earnings. A break below would signal a need for caution going forward. Bristol-Myers Squibb Co (NYSE:BMY) stock tumbled on Monday, falling more than 8%. Despite gaining FDA approval for its Opdivo-Yervoy treatment on first-line kidney cancer, positive data from Merck & Co., Inc. (NYSE:MRK) for its Keytruda drug for melanoma sent shares of BMY lower. Admittedly, the three-year daily chart isn’t the easiest on the eyes. But it emphasizes how important the upcoming $51 level is. Below all three key moving averages, BMY does not look healthy. $51 is a do-or-die level for investors. Should it fail, a retest of roughly $47 is in the cards — and shareholders should consider selling. Shares of Acacia Communications, Inc. (NASDAQ:ACIA) plummeted more than 35% on Monday and left its stock in need of deep repair. Now at its lowest price since going public, the company’s $23 IPO price could be the next target. Losing the $35 level was bad enough, but taking out the lows was even worse. I’d avoid or sell ACIA — especially below the lows. The risk/reward isn’t attractive enough to short now after such a big move. 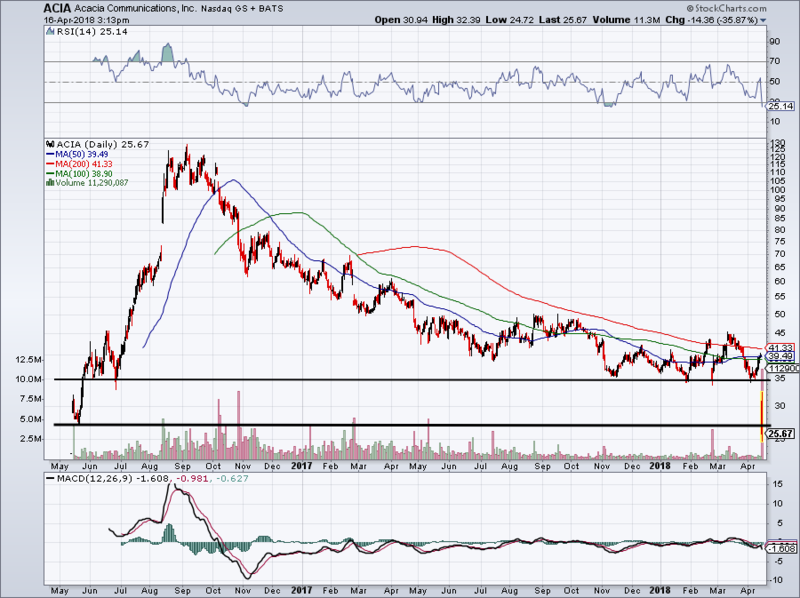 ACIA might be worth looking at for a bounce from $23 or if it can reclaim the recent lows. But even then, there’s a lot better options out there. On Monday, the autonomous driving plans for Ford Motor Company (NYSE:F) made the rounds and investors kept accumulating the stock. Ford is up more than 12% from its recent lows. 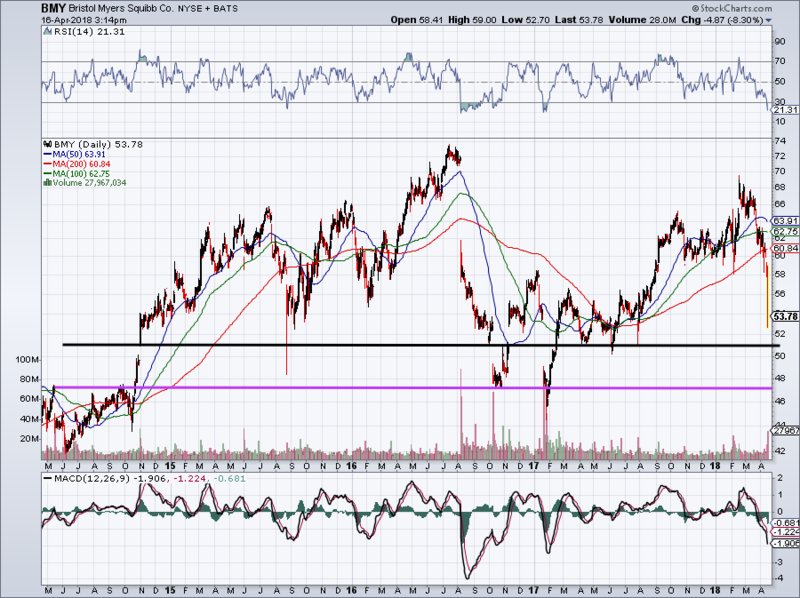 The $10 to $10.25 level is pretty obvious support for the automaker’s stock. That can be seen by the black line on the four-year weekly chart above. 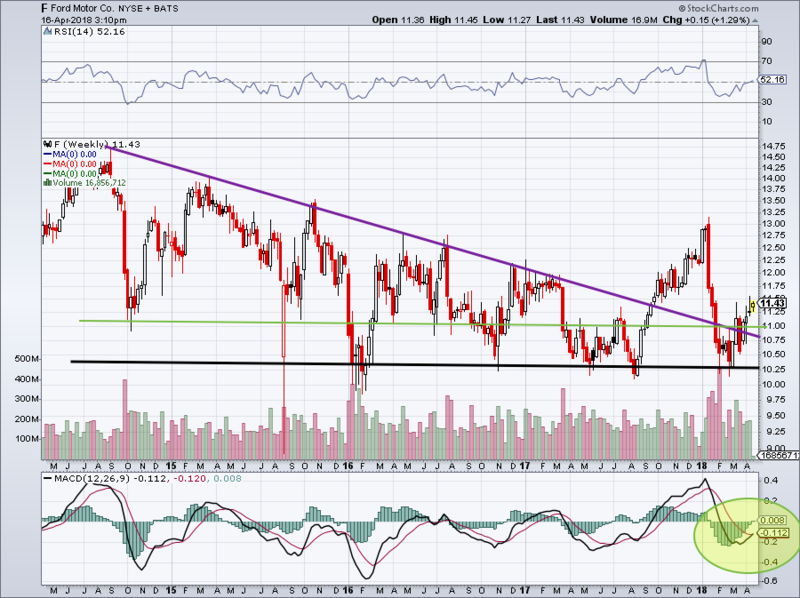 However, the stock’s downtrend line in purple is also pretty evident. So long as it’s above that and $11 (green line), it looks like bulls can stay or go long. Below those levels though and a retest of the lows are likely. Momentum (yellow circle at the bottom) is also swinging bullish. Starbucks Corporation (NASDAQ:SBUX) has been in the news for all the wrong reasons this weekend. Controversy whirled following the arrest of two customers at a Philadelphia Starbucks, prompting comments from the company’s CEO and boycotts online. Will the controversy hurt business? That much isn’t known yet, but it sure isn’t hurting the stock. As you see on the weekly chart above, SBUX stock began the week with a gain, climbing slightly on the day. It’s put in a series of higher lows (blue lines), but overhead resistance (black and green lines) still looms large. With earnings on April 26th, shares could rally into the print and selloff, or finally push SBUX through these tough levels. This could be an opportunity to profit. Bret Kenwell is the manager and author of Future Blue Chips and is on Twitter @BretKenwell. As of this writing, Bret Kenwell did held a long position in SBUX and JPM. The post 5 Trades to Make First Thing Tomorrow Morning appeared first on InvestorPlace.